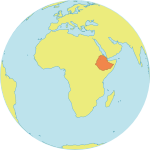 Graduate students at the Addis Ababa University in Ethiopia may choose to spend longer hours at the library researching population and development issues thanks to a donation of research monographs and scholarly periodicals by UNFPA. 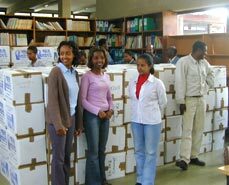 In June 2003, UNFPA officially handed over its entire printed library collection to the Institute of Development Research at the Addis Ababa University. The rich collection includes 200 journals, periodicals and newsletters, as well as some 5,000 books gathered between 1973 and 2000. Many of the items are no longer in print and are valuable resources for graduate-level research. 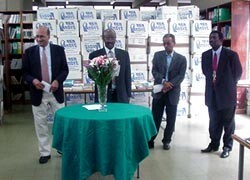 "UNFPA decided to dispose of its legacy printed library collection in keeping with its role as a development assistance organization," said David P. Rose, Senior Knowledge Sharing Officer, who managed the library transfer. "In this case, we directly supported the research and teaching capacity of a developing country university." The collection covers a wide range of subjects, including: population studies and demography; reproductive health; socioeconomic development and development assistance; women in development and gender issues; international organizations; and, country-specific reference materials. The UNFPA library was established in 1973 under the leadership of the first Executive Director, Mr. Rafael Salas. A voracious reader, Mr. Salas expected his staff to keep abreast of new findings from scholarly literature. With the advent of the Internet, however, the need for a traditional printed library collection diminished. UNFPA staff increasingly began to rely on electronic information services such as Lexis Nexis, the POPLINE bibliographic database, MEDLINE and many other specialized full-text and reference resources collected in the online Internet Supermarket produced by UNFPA’s Knowledge Sharing Branch. The Institute of Development Research was selected based on the capacity of the librarian personnel to house, catalogue and manage the materials.